1. I will keep my acts, performance, and behavior in a manner that suits my sly intentions, especially when in costume. I will remember that a bad clown will entertain others by making fun of himself, AND as many innocent bystanders one can find. 2. I will conduct myself in a manner deemed acceptable by the Association Of Badclowns, molesting, and terrorizing spectators and individuals only when appropriate. This may be applied under self diagnosis. Biting should only be used as an exception. 3. I will not drink in excess any alcoholic beverage prior or during my clown appearance, unless the beverage is really tasty, or the temperature exceeds 80 degrees, or drops below 60 degrees. In those cases, excess consumption is permitted, but of course should be monitored. 4. I will do my best to make others feel comfortable, and lull them into a false sense of security before I spring my bad intentions on them. 5. While on appearance, in make-up and costume, I will carry out the directives as outlined by the designated authority. If not applicable, all hell may break loose. I will also abide by all performance rules, and will not complain in public. Exception being: obnoxious brats; getting toes stepped on; or rejected by female spectators. In addition, if clown perceives act isn't going to plan, he may, if required, elect to throw tantrum. 6. 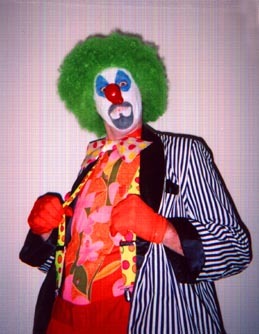 I will remove make-up and change to street clothes as soon as possible following my appearance, so that I can not be associated with any incident which may be detrimental to the act of clowning, or to my personal safety, such as evading detection from infuriated fathers, husband, and boyfriends. 7. I will appear in as many clown shows as possible, to further inflict fear and confusion in mass proportions.